The Good the Bad and the Insulting: Why Are Warhammer Fans Obsessed With Malal? As with every franchise, Warhammer 40,000 is a junkyard of old or forgotten ideas. From lost Black Library novels to retcons, every edition seems to lose something for everything it gains, sometimes for better and sometimes for worse. You've no doubt heard of a few of these, but it's always the big retcons which stand out: the infamous Spiritual Liege declaration, the obliteration of the Squats from all books, the introduction of the C'Tan, and Malal. It's that last one which seems to have endured the longest and retains a surprisingly strong following among fans, but you'd be hard pressed to find out exactly why. For those not in the know, Malal is effectively Chaos' self-destruction and internal conflict incarnate. Known as the Hierarch of Anarchy and Terror, his warriors were dedicated to the annihilation and destruction of other Chaos followers, hunting down and waging war against Chaos itself. It was for this reason he became known as the Renegade God, and his few followers consisted of outcasts, exiles and madmen deranged enough to follow in his pact. Often such warriors served as lone berserkers rather than the massed warbands of the other powers, seeking the heads of other champions. If Malal sounds like the patron or origin-giver to a bad 90s anti-hero, you're sadly not far off of the mark. One of the big pushes to hype his popularity came into play with The Quest of Kaleb Daark, which followed the blood-soaked tales of a Malalite champion. Created by famed 2000AD authors John Wagner and Alan Grant, it ran for three issues with a fourth unprinted script resigned to oblivion. In all honesty though, it wasn't much of a loss. While rightfully acclaimed for their work on Rogue Trooper, Strontium Dog and Judge Dredd, Daark was hardly a genre defining character. Woefully generic, broody and spiteful, he was akin to a bad parody of Sláine at the best of times. The unfortunate thing was that, with Wagner and Grant's departure, they took with them several rights to the god himself. 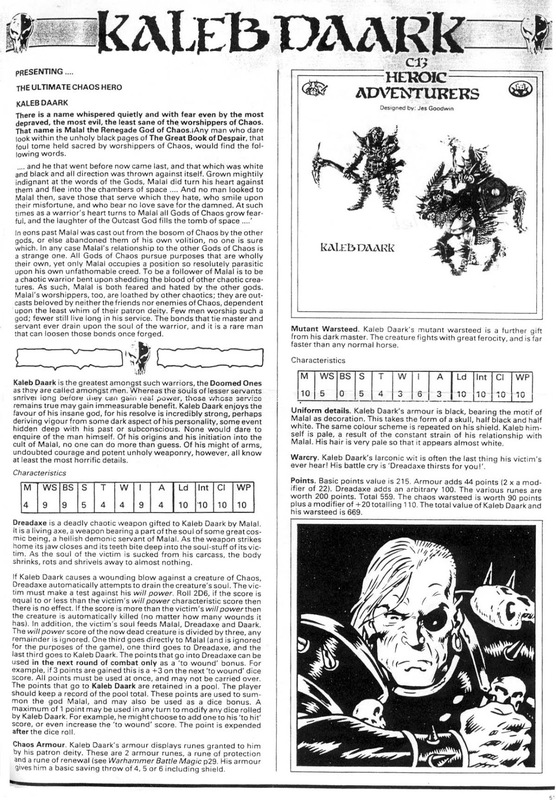 As such the name and use of Malal in future editions was barred to Games Workshop, preventing them from using one of their main Chaos Gods. They would again try to bring him back in several forms, but none have really stuck around all that well, and there's an obvious reason why: In the established pantheon, Malal was a third wheel. Malal's ultimate role in the setting might seem awesome at first, but once you really break it down many of the elements which define this god are ultimately superfluous. Hell, some actually limit storytelling potential for the setting as a whole, especially when it comes to Chaos. The whole point of Malal is arguably that he gains followers via Faustian pacts, using the hatred of Chaos to recruit new servants to carry out his will. In this regard he could be seen as a twisted dark mirror of justice, seeking out those whose hatred or determination to hunt down Chaos overrides all else in their lives. This could either be victims of Chaotic raids or even Witch Hunters themselves, and it links into the idea that anyone touched by Chaos could be dragged into his service. The problem with such a god is that Malal effectively runs a monopoly on the "He who fights monsters" storytelling tropes. In many regards this beginning is Chaos' bread and butter, as many of its monsters start of with either sympathetic beginnings or gradually turn towards darker tendencies as they embrace the Ruinous Powers. This isn't always true of course, and many stories have shown a deep shade of grey in the world lately, but at the same time the likes of the Horus Heresy, Eisenhorn, Trollslayer, and quite a few others show how well this stands out. It produces characters, heroes or villains, with a great deal of depth. If we were to limit this element purely to Malal, many of Tzeentch and Khorne's most famous turns would have never come about. Many other characters, major or minor, with surprisingly sympathetic histories or tragic fates would have never come into existence; the end result of which would have robbed many books of powerful one-shot villains or supporting characters. Another, much bigger, problem is that Malal represents an aspect of Chaos which can all too easily be seen as outright heroic. There's room for heroes on every side of each setting, even among the most unlikely groups like the Dark Eldar and Skaven Clans, but every side needs a deep shade of black. In Malal's case, the fact his whole purpose seems to be to thwart Chaos itself just seems too heroic. While he might be a dark god, it's a goal which aligns far too closely with the likes of the High Elves or Witch Hunters. This is a problem which was exemplified by the comic, where all too often Kaleb happily joined forces with the Empire to defeat his foes, turning him into your common or garden hero with dark powers. Even with all of the above problems in mind however (and i'm sticking to the big ones here to save on space) there's still one which thoroughly undermines Malal's very role within Chaos: His meaning. Say what you will about the other four powers, but each is distinct from one another, each opposes one another equally and you can see the role they play as a cornerstone within the Ruinous Powers. This is largely thanks to how they link into some primal force or another, from change to decay to euphoria and bloodshed. These are very grey subjects, dark ones once again but with streaks of positive elements such as Khorne's martial honour or how Tzeentch's core emotional force is thought to be hope. Destruction though? While that is certainly a primal force, it lacks some of the flexibility of other subjects here. Destruction and anarchy are simply that, a neutral force driven by the will of the person behind it, and there's little room for variation here. It proves to be remarkably shallow and, to make matters worse, too many distinct traits cross over with other gods. As such, rather than being a power unto himself, Malal can just seem like a tacked on addition. So, with all that in mind, why do players still keep bringing up Malal? The most obvious of these is the simple fact that he was removed from the canon. The odd sudden disappearance of certain factions and elements can drive fandoms crazy. It leaves those hungering to know more about the lore desperate to hunt down every shred of info they can. If something so massive as a Chaos god or faction is removed from the game, it will stick in their mind. Upon discovering it, upon learning that the universe is that much bigger than they first realised, it will help to stay in their minds. Chaos Dwarfs and Zoats continued to be talked about among groups of of lore obsessed fans, thanks largely to the sheer impact they should have had upon the world. Hell, if you want the quintessential example of how this can help an army live in infamy, just look at the Squats. Unpopular and relatively ignored (to the point where Games Workshop employees even called them out of place in the setting), their time in Warhammer 40,000 was hardly glorious, and they were seen as unremarkable creations. Yet after being hit with the retcon hammer so hard that their own creators refused to acknowledge their existence, they actually grew in popularity. This really is that one spark of a fan thinking "I wonder what they're trying to hide from us?" driving them to look into older ideas. 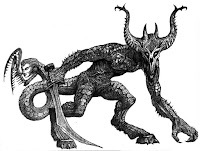 The fact Games Workshop writers kept drawing attention to this forbidden god allowed Malal to retain the attraction of a major retconned faction, but kept it in general awareness. Of course, Malal himself is hardly without his own benefits or appeal to hobbyists. While, as was pointed out above, many of his concepts were flawed or underdeveloped, there was no denying he retained some very interesting lore tidbits. The big ones tended to stem less from Malal's role within the setting or the nature of his followers so much as his power and realm. One of the more enduring images describing Malal's place of power was one of total torment to rival daemons; with tortures ranging from trapping a Changer of Ways in an immutable realm it could not hope to comprehend, to victorious armies marching past a crucified Bloodthirster. While he desired anarchy, focused upon destruction and desecration of others, the idea of Malal's home being a place of torment even to daemons was fascinating to consider. This was, after all, a place feared by the primordial night terrors of humanity, and a concept fascinating to behold. Atop of this, the idea of Malal's followers acting as individuals, spreading anarchy and destruction in their wake, suggested a very different kind of warrior. With so many other warbands gathering together, using their skills to venerate their dark gods however they could, allowed for the idea of a very different kind of warrior. One who, unlike the more structured hordes and forces of Chaos, truly embraced the anarchistic nature of the Warp itself. 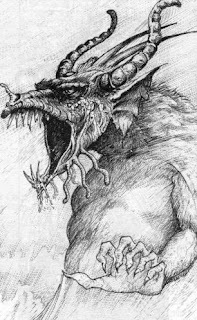 Even the very images we were given of Malal's daemonic host was extraordinary different from the mobs of Screamers, Bloodletters and Unclean Ones seen before. Masses of gnarled bones and hollowed scales seemed to make up his Greater Daemons, and the others were equally disturbing, retaining an incredibly Gothic mixture of bone, scales and insectoid elements which surely would have given the developers of Bloodborne nightmares for weeks. Even the most basic of these, a giant tick with a skull's face, still looked oddly horrifying thanks to the artistic talents which had brought the creature to life. They looked different, weird and bizarrely out of place against Chaos, and in many regards that was Malal's greatest strength. You'd be hard pressed to find a Warhammer fan who isn't aware of the four great gods of the Ruinous Powers. The mention of Khorne, Nurgle and the others instantly brings distinct images of certain daemons to mind, and certain characteristics tied into their very nature. While certainly versatile as a subject and open to interpretation, it's hard to shake that sense of familiarity. Quite often these days, Warhammer stories will gravitate back to the same variants of daemons and same powers for each of these gods. Even those which try to buck this trend will, ultimately, often gravitate back to the same core themes or basic elements. This leads to the obvious problem - The more we know of a great power, the more we see of it and the same traits, the less scary and less unknowable it becomes. This ultimately robs Chaos of its major edge and as a result the Warp becomes less like a sea of souls and more "that place daemons from from". Just look at Draigo to see how harmful that can be. The big question, as a result of familiarity with the big powers, has always surrounded the rest of the Warp. Only small hints have ever been offered, but we know of elements not bound to the four gods. These have ranged from whale-like creatures the size of worlds to more bizarre things like the Enslavers, but there have also been hints of other gods. Prior codices mentioned (almost humorously) several by name and the Raptor Cult itself is known to worship a minor deity of Chaos. With that bigger world out there, with that vaster realm lurking just out of sight, Malal served as a glimpse into what lurked beyond. While he might have been retconned, he reminded others that even at the most basic foundations of Warhammer 40,000's lore there were still known, stranger realms to yet be explored. Of course, this is all just opinion. While this is, admittedly, going off of more personal thoughts and observations of fans than any in-depth long-term analysis, but this seems to ring true no matter which fan I speak to. If you have your own thoughts, opinions or even ideas to throw into the hat however, please feel very free to come forwards and suggest a few ideas yourself. Given the age and obscurity of this subject, it would be interesting to see what people come up with. So here's the reason I like Malal, or rather I should say Malice, because I'm only a fan of the 40K version: I like the idea that good people can be forced to do terrible things, gain terrible allies, and yet still hold true to their cause. It's one of the reasons I like radical Inquisitors a lot more than the standard loyalist ones (somebody who thinks they are forced to do something terrible to avoid a different, horrible fate is also pretty good). It makes for interesting storytelling opportunities and also provides a reason for a lot of things being able to happen without you adding in extreme mary-sue powers to everyone, make Draigo a follower of Malice, or somebody that Malice is helping from the sidelines without him knowing about it and suddenly half the stuff he's done makes a lot more sense for example (though the other half is still inexplicable). Make the Legion of the Damned followers of Malal and you're able to explain their existence, abilities and appearance (that's just an example, personally I prefer them as they are). You can also find some examples in 40k where the various gods worked together, only to inexplicably turn on each other or their followers for no discernible reason, making Malal/Malice a third party slightly manipulating events to turn armies of Chaos on each other (or empower just the right hero at the right moment) would go a long way to explain a lot of the stupidity that happens with some of Chaos's defeats, and that can also lead to interesting story opportunities. I also specifically like the Sons of Malice, because they're supposed to be a chapter who turned to him out of necessity, but were so horrified of doing so that they also embody the aspect of self destruction, meaning they hate themselves because they remember that they used/wish to be loyalists and yet they can never go back because they need his powers to win against the enemies they face (and it was hinted their self-loathing is the reason behind their vow of silence). To escape the issue of Malal/Malice being heroic, you need to remember that he is self destructive in every sense, I remember one story about the Sons of Malice that outright stated that once the Sons had completed their objective (taking back their planet), they'd turn on him, and he on them (though unfortunately I can't seem to find the website I read it on (it was a copy/paste of an official story), presumably it went the way of most of the sites I used to visit and now only exists on the internet archive, if I can find even find it in there). It's for this reason he doesn't have many followers, and the ones he does have are full of self-loathing. Personally I like that because it embodies the concept of the Daemon very well, giving great power, fighting alongside you, but never your friend or true ally, and they'll toss you aside the second they think you're not of any more use to them. Now the reason I don't like him in Fantasy is mainly because of how the Chaos Gods used to work differently. In 40k you'd be very hard pressed to name a group of Khorne's followers that didn't run around trying to behead everything that moves, whereas in Fantasy you have entire functioning cities (based on population, not technology) dedicated to one god yet suffering very little noticeable effects, not to mention you have several other existing and established Chaos Gods besides the four. Malal being part of the setting is barely worth any note as he's easily replaced by the Horned Rat or Hashut as two examples and a lot of what he does was already being done by other gods, so he was completely pointless. I found a lot of interesting articles on movies too, keep up with the good work! The Emperor is Malal. Or they made a deal wayyy back. It's the only thing that makes any sense as to why The Emperor made such "stupid" moves and why Chaos has not already triumphed. The way I play my Malice Legion is that they hate the Imperium as much as the other Chaos forces. The reason being that the Imperium stands as the antithesis of Anarchy, every citizen living under strict laws made by tyrannical bureaucrats and enforced by indoctrinated servants. The Emperor, although crippled stands as the bastion of this tyranny and so my Malice aligned legion fight them at every opportunity with the same silent viciousness they do when fighting Chaos. upstanding citizen. Just think about it. Well isn't it obvious, Chaos is a reflection of the Universe but in the Warp. Can it be than the little "links" placed here and there about Malice and his followers are in fact part of the true nature of the Chaos God Malice? 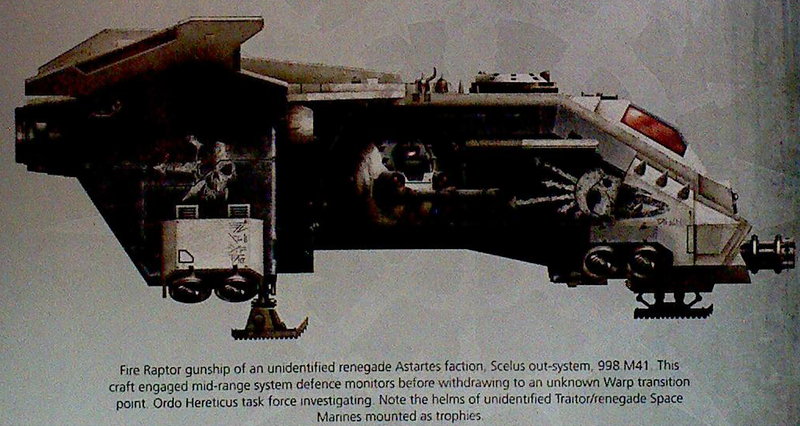 That being said, i get your point, GW take several measures in-universe to actualy protect the franchise of Retcon, what i mean by that is they can say, "The Squats are not cannon anymore" but then you have somewhat explications inside the lore than make it seems like the Squats removal is more like a "dissapearing" or one "erasing from the official files because some imperial reason". Indeed, in W40K There is always space for mistery, there is always space for the unknown an the things than some faction or another don't want the rest to know... hence... they play brilliantly with the mistery of them elements in order to gave them always a place to be in-universe but not necesarely in an "active" state, like Squads for instance, when they where removed, another Dwarft faction was added later, which is still, very misterious, and probably, if any day they are developed in a more deep way, maybie squads are presented as a cultural ancestors of this ones, or some other way related. The way GW avoid do direct "retcons" is brilliant, you can even argue they never do one in that matter, because even the act of recton for them is lore-wise possible and justificable and universe-wise correct, that's an awesome design, at least in my point of view. It's ironic that Archaon essentially took Malal's role since Warhammer: End Times ; a demigod who although is empowered by Chaos, hates any form of hierarchy in the Warp (meaning: he hates every single god of the Warhammer Universe) and tries to nullify it by reaping its "power source" (aka the mortal races). Well... The appeal I find in Malal is in it's outright viciousness of plotting the whole world destruction. On one hand, we got a God which is, namely, Chaos incarnated and who hates himself. Well, of course he wish to obliterate Chaos, in his mind he IS Chaos, and when Chaos grow stronger, he grow stronger. So if he destroys Chaos, he destroys himself - and that's precisely what he wants, to die. But hey, what's a world without Chaos ? Absolute Order ? For the only absolute Order existing would be the Nothingness, it means that to kill himself, aka commit suicide, Malal need to destroy the Universe as a whole. Now, only destroying Chaos wouldn't be sufficient, isn't it ? As long as there is life, there will be Chaos, and so will he be here, still wanting his own death. Now, on another hand, we got many strange things happening everywhere. A sect worshiping a God based on a C'Tan corpse, namely the Mechanicum, whose number is 1 and symbole a half-white half-machine skull. Hey, isn't Malal's number 11 and symbol a half-white half-black skull ? Now, C'Tans are at the opposite of the Warp, yet worship is linked to hope, belief, and all kinds of emotions which reflect back in the Warp. So, what if Malal was the one giving this little cult it's little bit of credibility ? I mean, isn't those guys on Mars complete madmen who want everything cybernetised, destroying the very core of life by replacing it by something-not-really-alive ? Second, the Alpha Legion. Two mysterious twin Primarch about which we don't know crap, yet joins forces with Chaos after some Xeno Organisation asked them to. What was it about already ? The Cabal, an organisation able to know the possible outcomes tens of thousands of years in the future, reached out to Alpharius and Omegon through John Grammaticus. They told them "Hey, if the Emperor wins, then Chaos survive. But if Horus win, humanity is destroyed, but the Chaos Gods die, and the other species survives. But beware ! If it ends in a stalemate, the Emperor will be kept alive in an half-dead state for tens of thousand of year, stagnation will take place, and at the end everyone will die, the whole galaxy burned...". In my opinion, we are pretty much in the third part of the prophecy. Why ? Because those two primarchs told there Legion - a Legion which can act on it's own without any need of command, always with a greater plan they aren't aware of - to join forces with Horus during the Heresy, then disappeared, thought deads, with all the tools and data of the Emperor's on the Primarchs creation - which they were supposed to bring back to the Cabal. If you think about it, you will understand that he is not limited by "what the warp can and can't do". His Daemons might run past Gellar Fields, or even stay materialized in zones where the Immaterium doesn't exists. So many hints at a strange "force" who do things he shouldn't be able to do, and seems to be at every single corner of the whole plot, yet you can't put a name on it. Well, aren't names, by nature, a mean to bring a bit of "order" after all ? It might be only speculations on my side, but... What if ?